In ancient Athens, there were two very famous men called Demosthenes. One was the general who fought in the Peloponnesian War. This one here is the politician and orator. 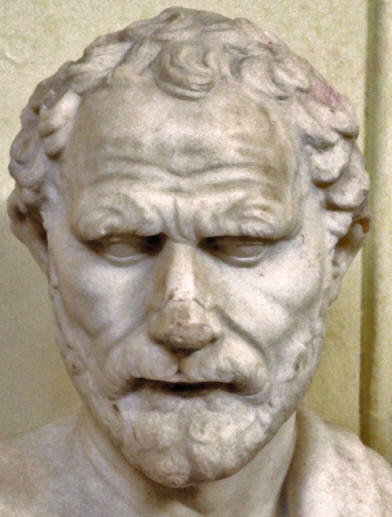 Politically, Demosthenes was against a peace treaty with Philip II, the king of Macedonia. Along these lines, Demosthenes delivered his Philippics - Three, possibly four, excellent speeches to rally his fellow Athenians against Philip. In 341 BC, Demosthenes delivered his Third Philippic before the Athenian Assembly on the Pnyx Hill. It was one of Demosthenes' best speeches. In 330 BC, Demosthenes gave another brilliant speech, On the Crown. This speech was delivered in defense of Ctesiphon. Why was Ctesiphon in need of justification? He had previously suggested to present Demosthenes with a crown in honor of Demosthenes' good deeds for Athens. This didn't sit well with some of the men of Athens, especially Demosthenes' political long-time enemy Aeschines was outraged. Ctesiphon was tried in 330 BC and, thanks to Demosthenes' intervention, acquitted. Aeschines had to pack his bundle, left Athens, and settled on Rhodes.